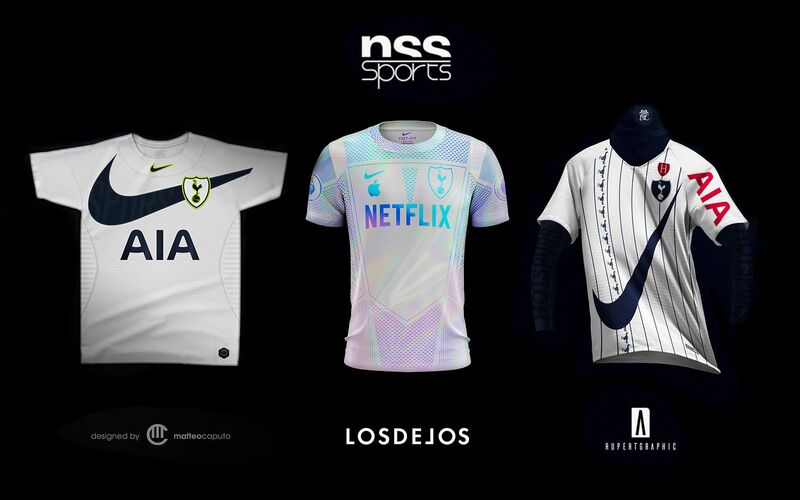 A fashion website has reached out to 3 famous graphic designers, asking them to imagine and create concepts of how Tottenham kits might look like in the future. It is explained that the idea took shape after the North London club’s agreed on a record 15 year supply kit deal with sports apparel giants Nike that runs till 2033. While there seems to have been a lot of thought put in the creation of all the various designs – the history of the club is taken into account, some iconic templates have been referred too and even some strange future technological innovations have been anticipated – we’re not sure how Spurs fans will react to these experiments regarding their traditional colors. One strip that specially stands out is the one which is designed with “wifi” connectivity that is imagined to allow coaches to get real time stats of a player. The same shirt is also graced by logos of Apple and Netflix, who’re assumed to have joined the club sponsorship game by that time.